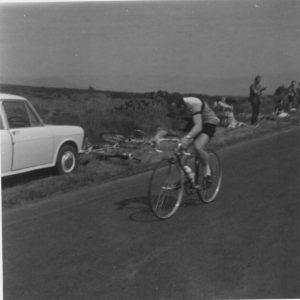 With Cyclefest in the can and the British Cycling National Road Championships looming on the horizon, it’s a fitting opportunity to remember the Island’s first gold-winning Commonwealth Games medallist who set the pace in cycling during the 1960s, but died tragically in the midst of his ongoing success. Peter Buckley was born in Peel to Joan (née Quayle) and Louis Buckley, a member of the Peveril Camp Guard, and although he later relocated to Oldham in Lancashire he always maintained he was proud to be a Manx man; returning regularly for training. 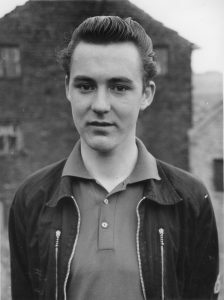 When he was selected for the 1966 Commonwealth Games in Jamaica (where Buckley celebrated his twenty second birthday) he chose to represent the Isle of Man, although in some quarters his victory was perceived to be just another win for England. However, this view was not shared by the British Cycling Federation, who saw it as recognition for the tremendous support that the Island gave to cycling. 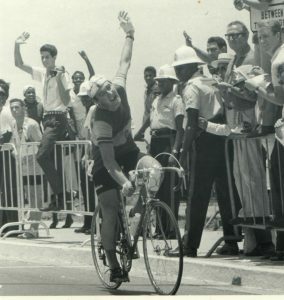 The race itself was a feat of endurance which raised genuine concern amongst doctors and officials, but ultimately shattered the theory that endurance events in Jamaica would be beyond the physical limits of competitors. A gruelling one hundred and twenty mile road race from Kingston to Manchioneal, Buckley survived a crash by the leading group in the early stages, but rode with determination through tropical rain storms amongst the mountain foothills, tackling slippery, winding, crumbling roads, pot holes and an unwanted puncture. Many of his competitors crashed out of the race, but Buckley’s pledge to win gold for the Isle of Man spurred him on to victory, in a record time of just over five hours – almost one mile ahead of the second placed man. But the race had taken its toll of a dazed Buckley who was helped from his bike at the finish line, soaked with both rain and perspiration. He freely admitted that it was a tough, punishing course presenting its own dangers, and there were times when he considered pulling out. Although he had ridden lon ger races this was the most gruelling, riding alone for the final forty miles and battling extreme tiredness during the closing stages. Buckley’s success aroused enormous pride on the Isle of Man, and the Manx team was greeted by thousands of cheering well wishers at Ronaldsway Airport, which Buckley quipped was better than a Beatles’ welcome, followed by a government reception and presentation of an inscribed silver tray. Additionally, Buckley and his family attended further presentations in both Peel and Douglas. Crowned Sportsman of the Year on the Isle of Man in 1967, Buckley returned to his job as a clerk in a railway company and his training regime, in the hope of being selected for the next Olympic Games, winning the Manx International Road Race, and securing top places in the Tour of Mexico and the Tour of Britain Milk Race. The Peter Buckley Series became one of the most prized awards in UK cycling, but tragedy was waiting in the wings. 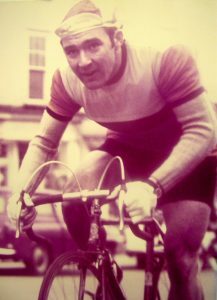 Whilst out training Buckley was involved in a collision with a loose dog at Hebden Bridge in the Yorkshire Pennines in July 1969 and he subsequently died of his injuries – struck down in his prime after establishing himself as the leading amateur rider in Britain at the age of twenty four. His ashes were interred at Peel Cemetery. Buckley was acknowledged as a gentleman both on and off the bike and as an excellent ambassador for the Isle of Man, but his memory lives on through the establishment of the Peter Buckley Trophy (awarded to competitors from the junior cycling league) and now presented to Dot Tilbury’s Junior Cycling RLS 360 and awarded to the most promising competitor, together with a memorial seat placed at Creg Willey’s Hill (Creg Willy Syl – Willy Sylvester’s Rock). Meanwhile his Commonwealth Games gold medal and other memorabilia can be seen at the Leece Museum on East Quay in Peel – admission free.